Many writers have written about the immigrant experience, but most focus on the tension between generations: how the older generations of immigrants—those fresh off the boat, so to speak—want to remain full of tradition and sentiment while the younger generations—the new Americans born and bred— want to shun all back-home practices. Satyal has turned this conventional wisdom upside down with No One Can Pronounce My Name. Ranjana, one of the book’s main characters, is a struggling (and secret) writer in Ohio. Her son Prashant thinks she tries too hard to be unlike all the other aunties he knows, but the truth is that she feels more affinity with her adopted American homeland than she does with India. From her dalliance with romance writing to the Starbucks frappucino in her hand, she’s as different as possible from the stereotypical Indian housewife we see on television and in books. Other characters are no less complex. Harit has more sentiment for his old life in India, but he struggles to live in a new environment, which he often doesn’t understand. After the death of his sister Swati, he has taken to dressing up in her clothes and makeup to emerge in front of his grieving old mother. 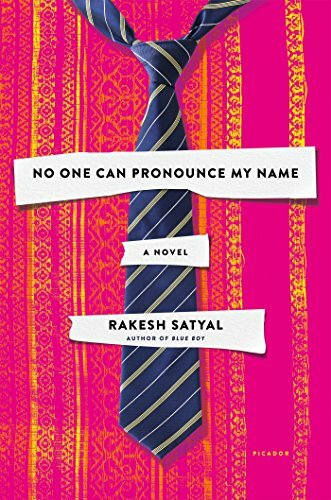 This—a sari-wearing middle aged man—in itself is a very nontraditional concept, and thus Satyal continues his novel with non-traditional characters, perhaps to show us that immigrants are just as varied as their native-born counterparts. True, there are many stereotypical problems addressed in this book, most notably the way “foreign” names are pronounced by Americans. This may seem unimportant to some readers, but the reality is far different. Names form a big part of a person’s identity and therefore mispronouncing a name that can easily be learned correctly shows a lack of openness to the immigrant’s identity in the minds of the host culture. This happens time and again with the characters, leading readers to understand that it is, in fact, a bigger deal than they often think. Other topics are very much American. Ranjana faces the same feeling of empty nesting that millions of middle-aged parents feel when their child goes off to college. Her husband goes through a mid-life crisis feeling that a wife with a job is a source of embarrassment for a man. Prashant is a young man with a crush, a nerd at Princeton with all the expectations of our university culture. Harit deals—badly—with the grief of his sister’s death. Regardless of the skin color or ethnicity or country of origin, we all face these life-changing obstacles at one time or another. The overall takeaway from No One Can Pronounce My Name is that the struggles immigrants face are much more complicated than the basics of life. None of the characters are poor, nor do any of them face social or economic stigma. What they do face is a strange loneliness, as if they are islands within a larger community where they stand out because they are different. For all the pride America feels for its values of individuality and independence, newcomers face the strongest backlash because of their differences: their accents, their physical appearance, and their names. No one can pronounce their names, not because their names are difficult, but because society wishes to penalize them for their different nature.